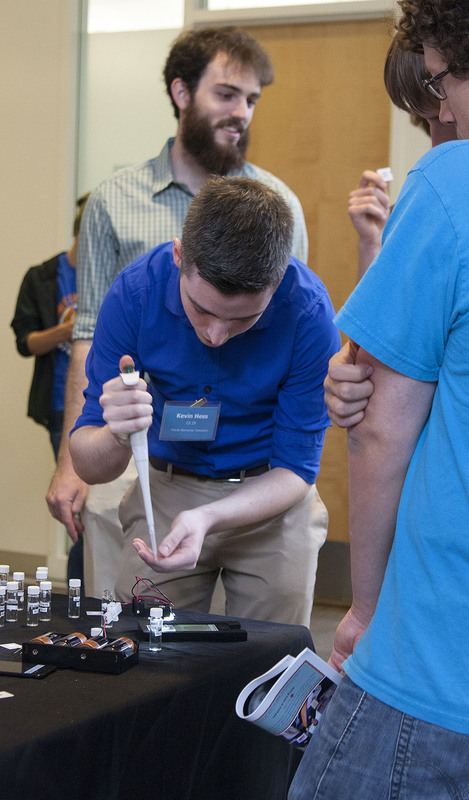 Kevin Hess demonstrates the mobile biomarker detection app at the OSU Engineering Expo. Three Oregon State University computer science students worked with the Remcho Research Group at Oregon State to develop an iPhone application to automate the testing of enzyme slides. The biomarker detection app was developed by Kyle Cesare, Kevin Hess and Joe Runde for their senior design project. The application speeds up the process of analysis, and will allow medical personnel and researchers to perform the tests without expensive equipment, such as remote locations in developing countries. The mobile app complements a new type of chemical test the Remcho lab developed to detect whether or not an antimalarial drug is genuine. Many lives are lost to the use of counterfeit antimalarial drugs — an estimated 200,000 a year according to the World Health Organization. The students are releasing the app under an open source license so others can build on the technology they developed. “I think we could start to see a huge impact on global healthcare, especially in the developing countries, as people begin to see the power and convenience of mobile devices. I hope that our app helps that realization happen quicker,” Kyle Cesare said. 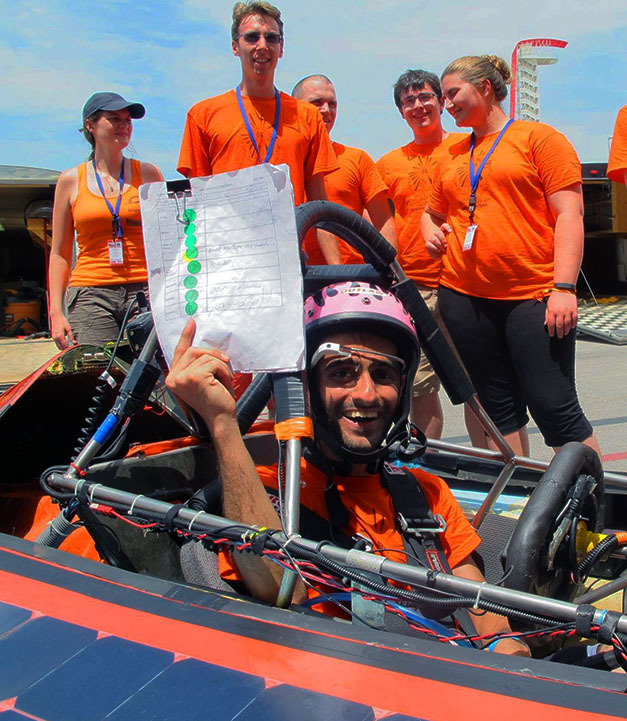 Sami Al-AbdRabbuh, one of Oregon State’s Solar Vehicle Team drivers, holds up the check-off sheet that shows they passed the scrutineering phase of the American Solar Challenge. Sweating it out in Austin, Texas this week, Oregon State University’s solar vehicle team was the first team to finish the “scrutineering” portion of the American Solar Challenge. This qualifies them to compete in the Formula Grand Sun Prix, which they won last year. The track race is a qualifier for the main event — an eight day road race through seven states from Austin, Texas to Minneapolis, Minn.
During scrutineering the teams go through a series of tests to make sure the vehicles are safe and follow regulations. “It went really well. Our team leaders did a great job of preparing us, and I think that’s what made the difference for finishing first,” said Abhishek Raol, one of the drivers for the team. Next up is the three-day track race. Starting Thursday, July 17, for eight hours each day the teams complete as many laps as they can on the Circuit of The Americas — a 3.4 mile track that includes an elevation gain of 133 feet. Last year the team completed 193 laps (661 miles) which was just a lap ahead of their nearest competitor. This year the competition looks to be stiffer. “When we won last year, 12 teams competed. This year there are 23 teams including some tough competitors like MIT and University of Michigan,” said Dave O’Gorman, advisor for the team and marine technician for Oregon State’s College of Earth Ocean and Atmospheric Sciences. Teams from all over the U.S. and Canada and teams as far away as India and Iran are competing this year. 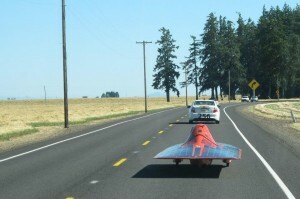 Oregon State’s solar vehicle is named Phoenix, in reference to a car fire that in 2011 burned a previous version to the ground. Around 30 students have been working with the team all year to make improvements to Phoenix, and 11 students traveled to compete in the race — four are drivers and the rest work to keep the car operational through the grueling 11 days of racing. O’Gorman said that the team has had students from every branch of engineering including nuclear and chemical, and even some non-engineering students from time to time. Abhishek Raol, a student in electrical and computer engineering, joined the team as a sophomore last year because of his interest in renewable energy. “I also really wanted to apply what I learned in school to a real life experience,” Raol said. Although his focus was on the electrical systems he has also worked on mechanical projects and the integration of electrical and mechanical. “That’s been really interesting for me, to see how electrical engineering works in a whole system,” he said. Raol is one of the drivers for the team and is excited to start competing. “Not everyone gets to drive a solar car so I took the opportunity. It’s neat to be able to drive what you have been working on for so long,” he said. 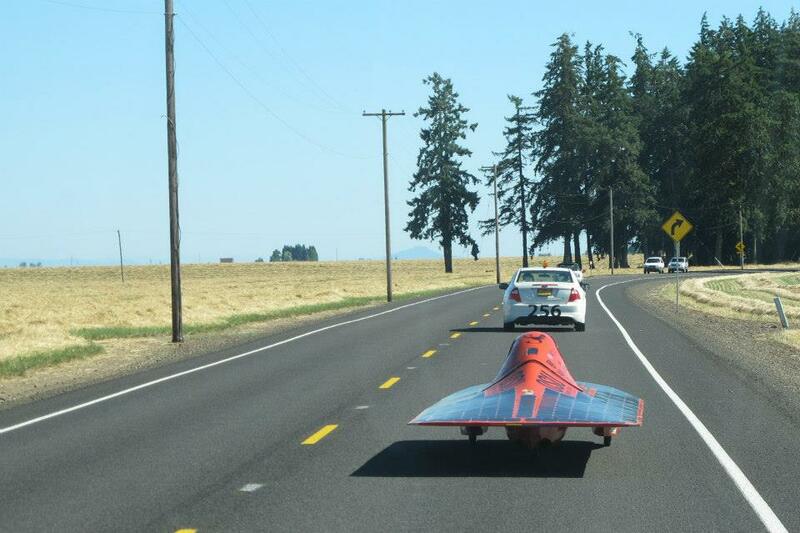 Oregon State’s solar vehicle, Phoenix, on a test drive. Raol said the 8-day road race will be the most nerve-racking part of the event in which the solar vehicles travel on highways and freeways for eight hours a day following a detailed route. Although the car can reach up to 60 miles per hour, under certain road and weather conditions they might be traveling as slow as 15 to 20 miles per hour. For safety, the solar vehicle is flanked by a lead and chase car with the other team members that are at the ready to make repairs along the way. Although the race is a competition there is a cooperative spirit among the teams that help each other out by loaning parts and offering assistance for repairs. Last year Oregon State’s team also won the sportsmanship award. “I’m looking forward to working with the other teams and learning about how all the different systems work,” said Gray Johnson, sophomore in electrical and computer engineering. O’Gorman has been extremely impressed with the team which he has been helping out for the last couple of years. “The thing that really blew me away is that the students do everything from the initial design, the machining, the welding and the troubleshooting. It’s amazing to be part of because the students really do it all,” he said. The team is posting to Facebook and Twitter and have a live webcam of the event. Team member, Bonnie Wood, was featured in a story by the Ashland Daily Tidings about the race.